Available in a 230 liter and 300 liter version, plus options without a heat exchanger, with one heat exchanger or even with two heat exchangers. 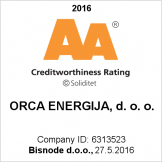 Energy efficiency of heat pumps for heating Orca places the heat pumps into the highest energy classes. Orca Zeus is ideal when there is little room is available. Despite taking up very little space, these devices produce a fantastic yield and high power output in low temperatures. They also operate silently. The Orca Zeus Series is very costeffective because it can reduce water heating costs by up to 70% with a relatively small investment. Brilliant heating properties are complemented by two hot water tanks of different sizes, meaning they can be adjusted for smaller or larger households. Beautiful design with simple controls which can be mastered in minutes. 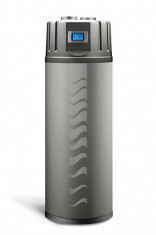 Available in two sizes: 300 and 230 litre hot water tanks which are very space-efficient. Two time intervals for even bigger savings and using overnight rates. Guided air and cooling option for different rooms (e.g. a pantry). Exterior exchanger prevents scale formation. Anti-legionella protection helps keep water clean. Options for connection to different heating systems (heating oil, wood, pellets or solar system). Produced in EU (Slovenia) with the highest quality components from European and Japanese manufacturers.